"It is the AAC's judgement that Pluto is here to stay and any future modifications of the Solar Walk should be additions or improvements." Approved by the AAC Board, 2006 Sept. 5. 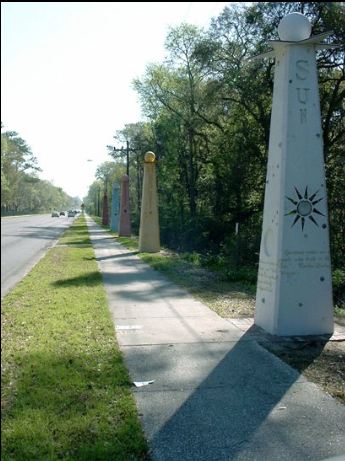 In March 2002, artist Elizabeth Indianos* installed a Gainesville public art project in cooperation with the Alachua Astronomy Club, Inc. (AAC) titled "Gainesville Solar Walk" at a cost of $30,000. The project was constructed according to proposal guidelines set up by the Art in Public Places Trust of the City of Gainesville, Florida and the AAC. Since this time the Art in Public Places Trust (APPT) - now called Department of Parks, Recreation and Cultural Affairs - has been cooperatively working with the Alachua Astronomy Club for additional enhancements to the site in order to make it an attraction for Gainesville. These enhancements (made in 2006) include: repair and cleaning of the monuments, design and fabrication of two benches (see Project Fact Sheet) by Gainesville Solar Walk artist, Elizabeth Indianos, installation of two pairs of interpretative signs designed by Howard L. Cohen of the Alachua Astronomy Club, Inc. and graphic designer Saydi Kaufman (fabricated by Crystal Graphics, Inc.), and finally installation of two donor plaques made by Creative Workshop, Inc. In September 2008 two Comet Halley sculptures were added to the Solar Walk (commissioned also by the City's Art in Public Places Trust, and designed by the artist Elizabeth Indianos with technical help from the AAC): (1) A Perihelion Sculpture with Tail at the location of the comet's closest point to the Sun between Mercury and Venus and (2) an Aphelion Sculpture without tail at the comet's farthest point from the Sun about halfway between Neptune and Pluto. Note: Comets are basically frozen bodies of ices, dust and rock and usually do not begin to form comas and tails until they approach the Sun close enough for their ices to begin to vaporize. Each sculpture sits on a black concrete slab embedded with glass stars and glittery silicon carbide. Two-foot tall dodecahedrons in star shapes represent the head of the comet. These forms symbolize Johannes Kepler's fascination with geometric shapes to describe the universe. Kepler was a seventeenth century German astronomer and mathematician who developed laws of planetary motion that later helped Edmund Halley predict the return of the comet that now bears his name. Yellowish and bluish colors in the tail symbolize the dust and gas content found in many comet tails. Signage describing these sculptures will be added later in 2008 or 2009. Click on links below to view each interpretive sign approved by The City Commission of Gainesville at its 2005 November 28 meeting. A pair of these signs was installed in 2006 at both the Sun and Pluto ends of the walk along with donor plaques on the backside of the Sun and Pluto monuments. Are you a teacher using the Gainesville Solar Walk for class projects? Please let us know what your project entails and how you think this web site can enhance the experience! The Solar System is Back! Spanning nearly a mile, the Gainesville solar system model has returned to NW 8th Avenue, beginning at NW 34th Street with the Sun, and ending at NW 22nd Street with Pluto. The monuments, designed and constructed from recycled materials by artist Elizabeth Indianos, were installed in February and March, 2002. Already, the model has drawn a lot attention, as the press releases to the left exhibit. To learn more about the history and development of the project (a decade in the making), please visit the links on the left. While within walking distance of Littlewood, Westwood, Glen Springs and Finley schools, we believe that the Solar Walk will be an enduring learning tool for students (and adults!) throughout the region. A field trip to Gainesville's own solar system model will put your world in perspective. Eighth Avenue is ideal for a solar system model. While other models exist throughout the world, most cannot be viewed from a single vantage point. They may be too long for pedestrians or classroom visitors to appreciate, or too small to provide the relative diameter of the smallest planets. There are no cross-streets, and no business signs or driveways (unusual for such a long length of roadway inside City limits) so that each planet may be accurately placed, and pedestrians need not negotiate crosswalks every block or so. But the project is not yet complete. Future enhancement include additional benches, an asteroid rock garden, nighttime lighting, enhanced landscaping and more. Please review the information on this web site, then consider making a tax deductible contribution so that we may continue to enhance the project in future years. Information plaques adorn each monument. These plaques are an inherent facet of the educational model. Each shows the planet's relative size compared to the Sun in this 4 billion to 1 scale, distance from the Sun, rotational and orbital period, a rubbing area for the Solar Walk "passport", and more. You can see a sample design of the Pluto plaque by clicking the image on the right. Continue to help improve the Gainesville Solar Walk by making a tax deductible contribution to the AAC.